Key elements to consider when preparing your Business Card artwork for a printer. Now, you have decided to have your business cards printed for your new venture or an existing business. You have great idea about the layout and contents to go on to the card and you are an expert in using Microsoft Word or Publisher or any other applications like Adobe Photoshop or Indesign or illustrator. You spend considerable amount of time on putting (or designing, on your own words) all contents, images and graphics you downloaded from google or any other sources. Finally, you got it right what you would think perfect and ready to send the printer. You confidently shoot that email artwork to the printing company and hope to have them ready by next couple of days. Suddenly an email pops up notifying you that your artwork does not meet the print requirements and need to redesign or have to make it press ready. This is a real frustration, but what might have gone wrong? How can I possibly make print ready business card artwork. Here are few tips on how to correct design, what format to use and how to meet print ready artwork requirements for a print ready business card. On your document layout, make sure that texts, logos, images or other important elements are positioned at least 3 mm away from the trimming edges of the card. Otherwise a part of your text or logo may get trimmed when cards are cut. Most printing companies require the original artwork file to include bleeds. Bleed is a border surrounding the card which will be trimmed off during the cutting process to avoid white border around the finished product. So, when you export your design to PDF, click the Marks and Bleeds tab button. Make sure to check the bleed options with at least 3mm bleed. If you haven’t added bleed to your artwork, go to File->Documentsetup-> More Options->Bleed and add desired bleed. 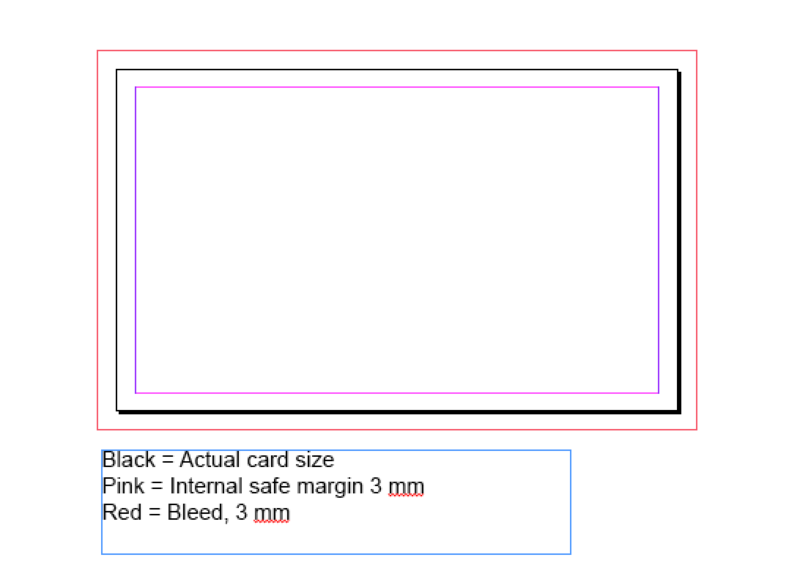 If you use a background or border in your card, it must go over the edges of the card upto bleed, otherwise clear area or white border might result on the edges of the printed card. Images obtained from a digital camera, scanner or from the Internet need to format accordingly. For images, resolution is crucial for good quality of the printed picture. A picture that looks all right on the screen, may have pixelated or blurry when printed. So your image must be at a resolution of at least 300 dpi. To check whether your image has enough resolution, zoom in on your document until 100%. If the image looks acceptable, it will look fine when printed. When you design your card,make sure that you choose the correct colour mode for printing which is CMYK. Cyan (blue), Magenta (red), Yellow and Black (this mode called “CMYK”). If Colours are used in RGB mode, it is not acceptable for printing process and your artwork would termed as a not a print ready business card artwork. To avoid fonts being missed or mismatched, embed fonts or covert all fonts to curves. Contact us if you have any questions on how to create specific artworks for your print requirements by emailing us.